I just happened upon the most delightful thing. It’s a gif of Vincent Price listening to a little man on his shoulder. Is it a miniaturized Shakespearian actor? And what does he want Vincent Price to do? So many questions. But it seemed selfish to keep this gif to myself. I’m also here to share a recipe for Everything Bagels that I found. Though I’ll admit, I’ve always been a bit leery of the Everything Bagel. They have a way of contaminating every bagel in the case with their oniony flavor. Not the best taste on a cinnamon raisin bagel. 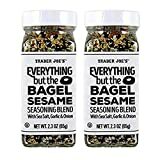 But today I saw that Trader Joe sells something called Everything But the Bagel Sesame Seasoning Blend and I thought I’d give it a chance. And I’m so glad I did. It’s absolutely delicious. These bagels are based on a recipe from Peace, Love and Low Carb. It uses Fathead Dough which is a mixture of almond flour, mozzarella cheese, cream cheese and eggs. It might sound funny to make a bagel out of cheese, but it’s surprisingly good. And you can’t beat the carb count. Normal bagels have about 70g of carbohydrate but these little beauties only have 8g net carb. Ok, the little man on my shoulder is telling me to wrap it up. Till next time. These low carb Everything bagels use Fathead dough to keep the net carb count down to 8g. 1. Preheat the oven to 425 degrees F and cover a cookie sheet with parchment paper. Whisk one of the eggs to use as an egg wash later on. 2. Mix together the almond flour and baking powder in a medium sized bowl. Add in the minced onion and remaining 2 eggs and mix well to combine. 3. Combine the mozzarella and cream cheese together in a large sized bowl. Heat for 1 1/2 minutes in the microwave and stir to combine. Heat for another minute and stir again. 4. Mix together the almond flour mixture and the cheese mixture until a dough forms. As soon as it is cool enough to work with, knead the dough with your hands until completely combined. If it is too cool to combine, you can microwave it again for 30 seconds. 5. Divide the dough into 6 balls. Stick your finger through the middle of each ball to make it into a bagel shape. Make a fairly big sized hole, since it will expand as it cooks. 6. Brush the egg wash over the bagels and sprinkle with the Everything Bagel Seasoning. You can make your own seasoning with this recipe from the Food Network. 7. Bake for 12-14 minutes until golden brown. It’s best if you eat them while they’re hot. If you like Trader Joe’s Everything Seasoning, then you might like my recipes for Avocado Toast and Everything Seed Cracker. Your ad says it’s 8 mg carbs, but the facts at the end of the recipe says 12 carbs. Which is it? It’s both. These bagels have 12g carb and 4g fiber so when you calculate the net carbs you get 8g. Net carbs are the carbs that your body processes and uses for energy. Fiber doesn’t count in net carbs because it passes through your digestion without breaking down. Because your body doesn’t use the 4g fiber, it doesn’t count in the overall net carb count of 8g. Do you use pre-shredded mozzarella or do you shred a ball of mozzarella? I ask because the pre-shredded mozzarella is treated with ingredients to keep it from not clumping and sometimes that affects the outcome in some recipes. That’s a good question. I recommend sticking with a pre-shredded mozzarella because the additives do help to hold the dough together. Do they have the same texture as a real bagel? I have tried another recipe and they turned out like tea biscuits. No, this is a cheese based “Fathead” dough so the results have a more bread=like texture. They’ve got air bubbles like real bread and have a nice chew to them. Some low carb almond and coconut flour baked goods can be dry with the texture of a teas biscuit, I know what you mean. I think you’ll like this recipe though. The short clip of Vincent Price is from “The Story of Mankind” (1957). Not sure who is on his shoulder but I don’t think it’s the devil because Vincent Price himself supoosedly plays the devil in that movie. Couldn’t find a clip to figure out what is being said to him but from his expression it would seem to be rather naughty. Ha, ha, ha! Thank you! Still a mysterious gif, but now at least I know where to find out more. (And yes, Vincent definitely heard something naughty. No question.) Thanks again for this info, helpful stranger! This recipe was a great find!! Thank you for posting it! So far, I have made the recipe twice and love it!! I found it to be a little messy, but that might be because I have ground my own almond slivers and maybe the flour is not fine enough. For me, while shaping the bagels it stuck to my hands a lot, but the mess was well worth it!! The bagels are very filling and sometimes I only have half with some other protein for breakfast. Interesting. I never thought to use ground almonds to make this recipe. But I agree that almond flour makes it less messy. Thanks for letting me know about the ground almonds alternative. I use a small coffee grinder on slivered almonds, but it does end up a little grainy (which I don’t mind and it seems to add texture). I’m not sure if grinding my own ends up being any cheaper though. I notice if I try to grind the almonds too much, they start to stick in the grinder. Thanks again for the recipe! The recipe says best when eaten hot. What happens if they are at room temp.??? Do they freeze well? I would like to make a batch and eat one each day. That should be fine. Just keep them in the fridge between days. I recommend toasting the bagels in a toaster oven before eating them. They are ok at room temperature, but because they are made from mozzarella cheese, they tend to harden up when they aren’t warm. They do freeze well though. Before freezing them, allow them to cool completely and then cut them in half. Store the pieces separately in plastic sandwich bags. Thaw the bagels and toast them in a toaster oven to reheat. Good luck! I think that low carb diets are very good for diabetics. It’s the diet that I prefer, because I find it easier to keep my blood sugar under control when I am eating fewer carbs and taking less insulin. But if you follow the ADA guidelines, then this bagel might have more fat than you might want. It’s got 545 calories and 36g of fat. It’s really a personal decision about how you want to treat the disease. Looooooove the Everything Seasoning. I use it on everything. These hit the spot! I love Everything Bagels and these taste like I’m eating a carb original. Thanks so much for the recipe! Yay! I’m so glad that you like them.